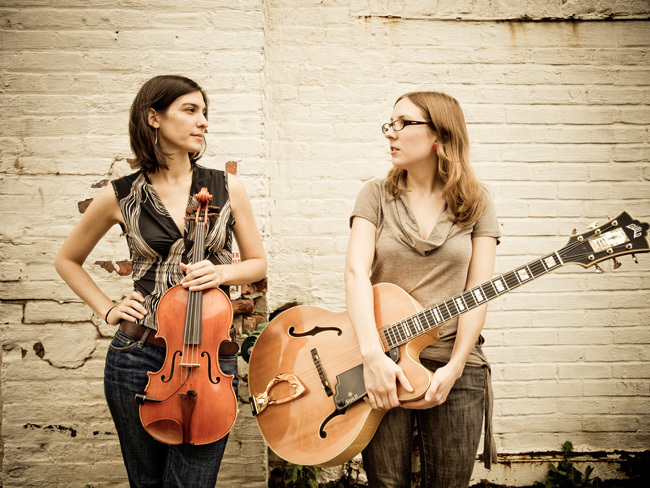 Guitarist Mary Halvorson and violist Jessica Pavone have a long-standing duo, now in its 11th year as a collaborative endeavor. They make music that embraces a wide range of musical traditions to create what Time Out New York describes as, "a challenging fusion of oblique art song, reflective chamber music and thorny free improv." Halvorson and Pavone have worked together in a variety of musical settings over the past decade, most notably the collective quartet The Thirteenth Assembly (with Taylor Ho Bynum and Tomas Fujiwara) and the ensembles of the iconic saxophonist/composer Anthony Braxton. Unlike those larger groups, their duo boils down its diverse influences into intimate original compositions that skillfully blend ethereal vocals and folk-inspired simplicity with an experimental edge, expanding their appeal beyond the boundaries of avant-garde jazz. “Their level of interplay borders on the clairvoyant", writes Troy Collins. The Duo has released four recordings to date: Prairies (Lucky Kitchen, 2005), On and Off (Skirl Records, 2007), Thin Air (Thirsty Ear Records, 2009) and Departure of Reason (Thirsty Ear Records, 2011). "The music challenges what is comfortable, with enough restraint to beckon the imagination, sometimes lifting and carrying along, sometimes dragging us toward what we cannot see," writes the Montreal Mirror. Guitarist/composer Mary Halvorson has been active in New York since 2002, following jazz studies at Wesleyan University and the New School. NPR called her “the most forward-thinking guitarist working right now.” Francis Davis called her “one of today’s most formidable bandleaders.” In addition to her longstanding trio, featuring John Hébert and Ches Smith, and her quintet, which adds Jonathan Finlayson and Jon Irabagon, Halvorson is a member of bands led by Tim Berne, Tomas Fujiwara, Ingrid Laubrock, Myra Melford, Marc Ribot and Tom Rainey, among others. String instrumentalist, Jessica Pavone leads the bands Army of Strangers and The Pavones, and has performed in ensembles led by Anthony Braxton, Jason Cady, Jeremiah Cymerman, Matana Roberts, Aaron Siegel, Henry Threadgill, and Matthew Welch. As a composer, Pavone has earned grants and commissions from the Aaron Copland Recording Fund, the American Music Center, The Kitchen, MATA, The Jerome Foundation, and the group, Till By Turning, which recently presented the European premiere of her piece "Quotidian" at Klangbad Festival in Germany. Her music has been released by the Tzadik, Thirsty Ear, Skirl and Porter record labels.